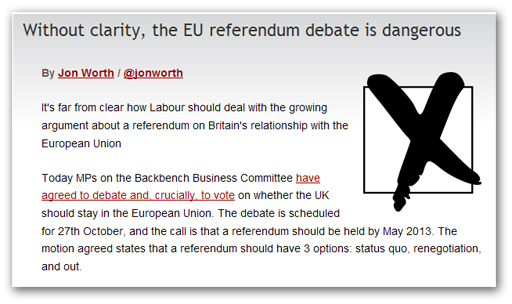 The self-important Jon Worth is giving us the "benefit" of his views on the EU referendum debate, over on Labour List, unwittingly displaying his own ignorance of the organism that he loves so much. He too falls for the misconception that we somehow have a "relationship" with the EU, failing to understand that the UK is part of the European Union. As we pointed out earlier, we can no more have a relationship with the EU than can Tim Montgomerie have a relationship with his left foot – or vice-versa. But where Worth especially falls apart is in pontificating about trade with the rest of the EU member states, opining that: "the cars we would export, the services we would sell would still have to abide by EU standards. So the notion that the UK would somehow immediately be set free of EU shackles is fanciful". What he fails to appreciate – as do many europlastics – is that standards set for motor cars and many other things do not originate from the EU, but from diverse international organisations. In respect of motor cars, the body of record is UNECE, where the standards are agreed through this intergovernmental body and then processed by the EU using the "dual international quasi-legislation/comitology mechanism". In effect, the EU acts as the middle-man, its bureaucracy translating the international technical agreements (which it cannot change) into detailed, actionable legislation. To that extent, membership of the EU is an irrelevance. We could, like Norway, buy in the legislative services of the EU, to produce our technical trade legislation, or go it alone and produce our own. The outcome would be largely the same, with the singular and important difference that we would not necessarily have to apply all standards to domestic industries (slaughterhouses come to mind). In displaying his ignorance, though, Worth points up a difficulty which afflicts both europlastics and euroslime. Neither group really understands how the EU works, or its depth of penetration into the UK body politic. Thus, when it comes to the relative advantages of membership, or quitting, and the mechanics of leaving, both sides are flying blind. Perhaps one of the biggest problems we have to resolve is the way policy-making over a wide range of issues has been outsourced to Brussels, leaving our civil servants and politicians unused to producing complex legislation. Re-acquiring those skills is going to take time. All of this, though, adds to the irrelevance of any debate in parliament. We have the blind leading the blind – the ill-informed conversing with the uninformed, the ignorant and the prejudiced. And to add to the unreality, The Boy is going to whip the debate, and all the good little Tories will roll up to obey. Basically, though, the EU is a lower-order problem which can best be resolved by dealing with the more fundamental problems in our societal structures. Here, I am no more keen on being ruled by Whitehall than I am Brussels but then, living in a "local" authority area of 500,000 souls, I am not keen on being ruled by the corrupt city state down the road either. Knowing where to start, and where to apply the leverage, is half the battle – and it is unlikely that the answers will be found in Westminster which, increasingly, is worth less and less. As my erstwhile co-editor concludes, we would be better off if the Tories voted down the motion anyway.